Alejandro Pena-Esclusa is a Venezuelan citizen, founder of the NGO’s UnoAmerica and Solidarity Force (Fuerza Solidaria). He is a mechanical engineer with graduate studies in financial management, and security and defense. 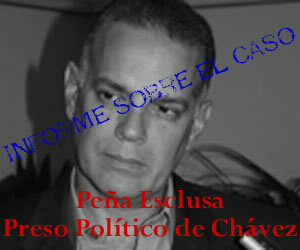 He was adviser to the National Security Council and Defense of Venezuela (CONASEDE). He is a writer and columnist. Married to Indira Ramírez for 22 years and have 3 young daughters. Venezuelan Cardinal Jorge Urosa told known journalist Macky Arenas on Radio Venezuela that Alejandro Pena-Esclusa -who is nowadays unjustly incarcerated- is innocent and should be released. The Archbishop of Los Teques, Ovidio Pérez Morales sent a letter to the Attorney General’s Office, Luisa Ortega Diaz, in applying for humanitarian reasons, the trial that follows is from Alejandro Pena Esclusa at liberty to the defendant can receive the medical treatment they require. Alejandro Pena-Esclusa is a Venezuelan politician, two times presidential candidate whose ideology and principles ruling his struggle are expressed in his extensive written work published on his NGO website Fuerza Solidaria. He is a renowned international lecturer against the violent forms of struggling and resolving conflicts, characteristic of terrorist organizations that have scourged Latin America, for considering them cruel, unfair and inefficient means. The case of Colombia has been an issue that has occupied much of his agenda. On July 12, 2010, a uniformed commando made up of 20 men of the Servicio Bolivariano de Inteligencia Nacional (SEBIN) or Bolivarian Service of National Intelligence, burst into the home of the Venezuelan political leader Alejandro Peña Esclusa, and took him prisoner. I have the honor to address this letter to you, in order to fully validate the accusations that your government has made regarding the connections of Mr. Hugo Chavez with the FARC. For two years I have been waiting for my imprisonment, due to the effective work I have been achieving against Mr. Chavez and his allies of the Forum Sao Paulo. In the coming days and weeks, the extent of this work will be disseminated. Friends and acquaintances, and even fellow UnoAmerica across the continent, insisted I had to leave Venezuela and work from abroad. “From the outside you can be more helpful to the cause, because in prison you’ll be will be given up for lost” they said.